This report estimates the costs, impacts and financing scenarios to achieve the World Health Assembly global nutrition targets for stunting, anemia in women, exclusive breastfeeding and the scaling up of the treatment of severe wasting among young children. To reach these four targets, the world needs USD 70 billion over 10 years to invest in high-impact nutrition-specific interventions. This investment would have enormous benefits: 65 million cases of stunting and 265 million cases of anemia in women would be prevented in 2025 as compared with the 2015 baseline. In addition, at least 91 million more children would be treated for severe wasting and 105 million additional babies would be exclusively breastfed during the first six months of life over 10 years. Altogether, achieving these targets would avert at least 3.7 million child deaths. Every dollar invested in this package of interventions would yield between USD 4 and USD 35 in economic returns, making investing in early nutrition one of the best value-for-money development actions. 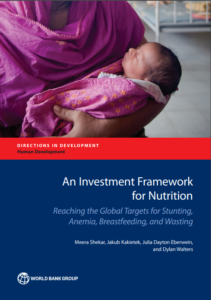 Although some of the targets—especially those for reducing stunting in children and anemia in women—are ambitious and will require concerted efforts in financing, scale-up, and sustained commitment, recent experience from several countries suggests that meeting these targets is feasible. Those investments in the critical 1000 day window of early childhood are inalienable and portable and will pay lifelong dividends – not only for children directly affected but also for us all in the form of more robust societies – that will drive future economies.